Two weeks have been spent preparing for this. Not only me but also fellow bloggers. After computing the scores given, here it is! The nominees this year are…..
Louis – I will get it out of the way that the look of the film is good and the special effects are great, otherwise then that the film is rather dull and much too boring. It follows a man who ages backwards through different events through his life time. It suspiciously resembles Forrest Gump, written by the same person and all. It just shows laziness on his part. I never felt for the characters or cared about them. The extreme story telling techniques such as the story of the clock and the story of Daisy’s injury are incredibly forced. I did not find a single thing interesting in this film, and one problem is that Button himself never really takes any action himself. He barely even notices that he is different. This film is boring and never interested me in the least. 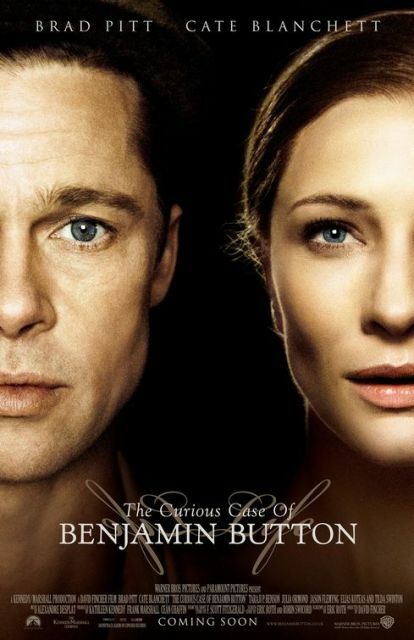 Kevin – Take the screenwriter from Forrest Gump and have him write the exact same script, only add elements of F. Scott Fitzgerald’s short story The Curious Case of Benjamin Button. Add David Fincher, indulging in middlebrow mess and not elevating the medium. Mix in Brad Pitt and Cate Blanchett in barely-there performances. Now add Taraji P. Henson as the only redeeming facet of the film. Cook at 365 degrees for almost three hours. Serves anyone who wants to be bored stiff. Malcolm – Extremely fascinating and spellbindingly executed that is mostly effective because of the movie miracle used to make it magical yet believable. But it definitely suffers from an inconsistent plot and its emphasis on superficiality. Robert – A technically marvelous film with a beautiful score and great performances that stand out. However, the film simply never completely convinced me of the fantasy of a man aging backwards. Andrew – Fincher’s two and a half hour long epic makes me invariably happy. I still recall the first time I saw it and how impressed I was. Each time I see it, I’m still impressed – the visuals, the acting, the direction, the story. It easily represents one of the best of the last decade for me. Walter – It touches me on every level. The comparisons to Forrest Gump are fair, but whereas that film is wide-eyed platitudes without a point, this is more laid-back, seen from an older perspective, one that has learned not to get het up over things you can’t control. It’s a subtle, moving piece that is hypnotic to behold. One of my favorites of all time. Kevin – I have absolutely no problem with the acting in Frost/Nixon. Actually, it’s quite good. Only Burn After Reading and, even moreso, Doubt featured better ensemble work than this film. However, I would have enjoyed Frost/Nixon infinitely more if it were not a typical Ron Howard film. Not only was the story plagued by inaccuracies (when your most famous line is something Nixon never even said, you’re straying too far from the truth), but it also had a flair for overdramatization (the phone call about “cheeseburgers”). On the whole, Frost/Nixon was good, but when compared to other movies in the same role in the Best Picture race (An Education, for example), this one can’t hold up. Louis – Frost/Nixon is enjoyable in some way for me, since it is based on true events that are rather interesting. This film by default is interesting to me, even though the film itself is not that good. The acting is alright although Langella overdoes the mannerisms since he is not doing an imitation, why is he doing them? I like the story although they could have kept it closer to fact and it would have been more effective. I do like the scenes of the interview. They work well, but many scenes not there do not. Director Ron Howard tries to make the interviews seem more important than they actually were, and that just rings false. I did enjoy watching it well enough, I believe its setting is well established and the relationship between Frost and Nixon is interesting. Not a great film by any means but I enjoyed it well enough. Andrew – Langella and Sheen are a good pair and the two do the best work in the film. It’s not perfect, but it is inspired and whatever missteps it takes it ends up serving a very “stagey” play as a legitimate film worthy of our time and even our admirations in some instances. Walter – Probably my favorite Howard, the one where he finally gets political and gives us a straightforward approach. Do the “documentary” sections add anything? Not really; they are a remnant of the stage production, and should have been altered. But there’s no denying that watching Langella and Sheen go at it is great fun. Robert – This film is a great political thriller, and it’s smart, sharp, and exciting, especially in the scenes with Michael Sheen and Frank Langella are together. However, its strange structure and air of self-importance bring it down a bit. Joe – Fascinating and has great performances. A bit too small of a story like The Queen, but it’s superior given that it’s more interesting. Malcolm – Consistently thrilling and thoroughly entertaining, the film is brought up by the astounding acting, brilliant script, and the breathtaking interview scenes. It sometimes feel too small to really care for. Other than that, it’s a very well-executed film. Louis – An overly glossy biopic that never really caught my interest well viewing it, I am not a fan of Penn’s performance and maybe you need to be to like the film. I always saw his overacting and many other actors overacting, they were almost playing into the stereotypes that you would think this film would want to avoid. Although I do like true stories this one never became that interesting and the documentary on the same events gives a better historical record. I never really felt I really got to know any of the characters that well besides Dan White who is well played by Josh Brolin. Everyone else is not really developed well and Milk himself is shown to be too overly positive. It would have been better if he had been intelligently examined; he did not have to be depicted negatively, but with more depth than is shown here. Not a horrendous film but not want that I enjoy, get emotionally effected by or find interesting in the least. Kevin – Blah. What could have been a truly phenomenal story was bogged down by pointless details and stilted storytelling, as well as odd, almost uncharacteristic direction from Gus Van Sant. 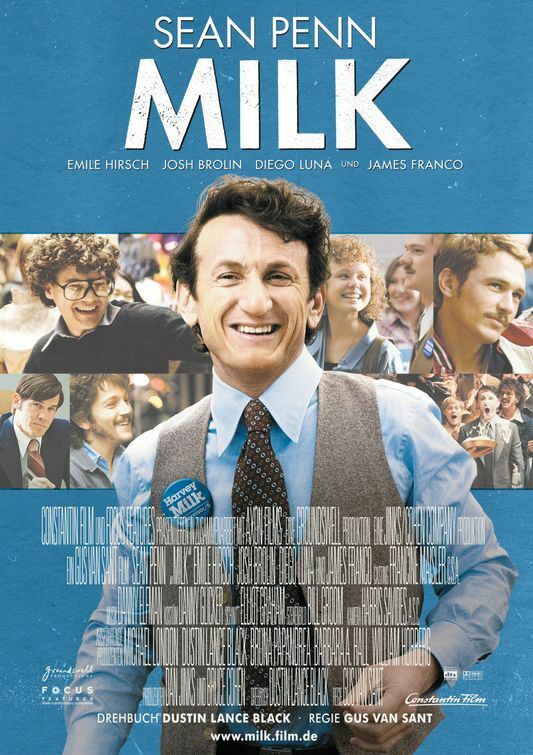 If Sean Penn hadn’t knocked it out of the park the way he did in his portrayal of Harvey Milk, I would have forgotten this film in its entirety two minutes after walking out of the theater. Malcolm – Perhaps the most “different” and most playful among the five. It has a strong cast, a smart script, and a profoundly inspiring message. But it is pulled down by the lack of energy at the first part. and the last minutes of it before the credits In other words, it’s plodding. Nevertheless, it is worth watching. Andrew – It doesn’t thrill me as much as others, but it is a good film nonetheless. Penn, Brolin, Hirsch and Franco stand out in my memory. It sometimes seems more of an ensemble film that doesn’t depend particularly on the director, but of course that Van Sant’s technique. It’s not my favourite, but it’s a valiant effort. Walter – Funny, touching, elegiac. One must admire it for avoiding a whitewash of its subject, which it very easily could have done, while still maintaining him as an inspiring symbol for a whole group. Harvey is mischievous, good-intentioned, a little amoral but never immoral. Anchored by a great ensemble and Harris Savides’ cinematography, Milk surprises by being an important film without the pretension. Robert – While this film could have become another formulaic biopic, it instead leaps above convention and manages to create a heartwrenching and believable portrait highlighted by brilliant performances from the entire cast. Joe – Inspirational, filled with amazing acting and a great script. I don’t understand the hate that Penn gets. I thought he was outstanding! A true achievement. Kevin – We all know this movie is only in this discussion because it was a Holocaust film and a Harvey Weinstein film. The lowest-rated Best Picture nominee ever, it’s beyond easy to see why. It just didn’t come together in the way it should have. And Kate Winslet finally won her Oscar…for what is arguably her worst nominated performance. Louis – A film very maligned by many. I did not much care for it either. The story of the affair between the Nazi older woman and the younger man never felt too insightful in my book. Then later when she disappears and he sees her war crimes trial, I still was not interested. I never felt any really drive in the story. The later scenes with older man I still was not interested, especially not by the scenes of his stares into the distance, thinking. Then the later scenes of her learning to read came off as unintentionally funny to me, never insightful and never interesting. Walter – The first two acts are strong, but it all peters out by the end. A shame. Ralph Fiennes is good, but his sections are the least interesting, the most apparent victim of the rushed editing. Kate Winslet forgets to play the lighter moments, but David Kross is a great revelation. Pretty good, but that last third bogs the whole thing down. Robert – Though it does manage to achieve some greatness in its second half, this film is obviously trying too hard to win Oscars and it often drags endlessly. The cast, however, is quite fantastic and though I don’t think it’s Winslet’s best performance, she proves she can do truly anything. Andrew – Daldry’s third outing is completely different from his other two works, but still as impressive. It’s more than Kate’s admittedly good performance, the entire cast is excellent particularly David Kross and Lena Olin. The tension in the courtroom, the flawed romance of our protagonists and the sombre finale – all are handled excellently. Joe – A spellbinding, haunting film. I understand the hate, but I loved it. Winslet is amazing! Malcolm – I’m already thinking if I’m going to place this as the best non-animated movie of the year. A movie that got a lot better in the second viewing. The boring became haunting. The silent became meaningful. It had the advantage of having great performances. Totally compelling and watchable. Andrew – It’s not as bad as the haters say, but I don’t think it’s particularly good either. It’s definitely watchable even gripping at times, but sometimes it’s just a bit too jarring for me to take it seriously. Louis – I enjoyed Slumdog millionaire much more when I watched it the first time. The second time not so much. The Dickens’s like story is good but not that interesting. I liked follow the main character through his adventures but I did not like it that much. It was okay but nothing was that entertaining to me, nor was emotionally effecting for me. The film tries to set itself well, and it does fairly well, but still their sense of place is not amazing by any means. The film just did not affect me at all, it did not bore me but it did not really pull me in either. An okay film not great but not really bad either. Walter – I like Dickensian coming-of-age stories, and there’s no doubt that Dev Patel is a likable lead. In the end, though, it wants to eat its cake and have it too. They want to romanticize the slums, but they also want to get their heroes out of the slums? It’s a little murky, and letting us know ahead of time that Jamal is going to win takes the suspense out of it – but hey, that’s FATE, right? The Latika story is a thing of beauty, though! Joe – I loved it at first, but now I’m not so sure. The direction is what makes it work, but the story feels like a tired cliche. Still, well directed. Kevin – Slumdog is actually a good movie. It’s not good enough to be a Best Picture winner ordinarily, but it had the benefit of a weak year as well as mass media hysteria. But watching Slumdog again is enough to realize how full of holes the plot was and how much of the acting was either overdone (Anil Kapoor) or just barely there (Freida Pinto). Overall, though, the story was good, and the direction was fantastic (Danny Boyle really did deserve the Best Director Oscar). Malcolm – Not sure if it’s really the best out of five since I rewatched it, but it certainly is the and most entertaining of them. It is an inspiring celebration of the journey of life amidst odds. And even if the story itself is not really original, it certainly is most dynamic. Robert – I know a lot of people dislike this film, but I just can’t see why. It’s a powerful, exhilarating and wonderful piece of cinema with a love story that is painfully believable. While this movie could have become ridiculous because of its reliance on coincidences, it never crosses that line and instead is a joyous celebration of life and love. So, no film received a score lower than 20. You’re not mistaken, dear viewer. Based on the scores, it’s really Frost/Nixon. I’m surprised myself. You want to see the figures? Scroll down please. Before the interesting facts about the scoring of the nominees, here are the final words from the members of the jury about the year…..
Joe: 2008 is a very strange year for me, since my picks have changed so much. At first Winslet was my pick for Best Actress, but then I saw Rachel Getting Married for the third time, and now I’m with Anne Hathaway. My Best Picture ranking has now completely changed and Rosemarie Dewitt is my personal choice for Best Supporting Actress. Kevin: I don’t think anyone will look back fondly on this year in Oscar history, at least as far as Best Picture is concerned. Most critics have a problem in retrospect with Slumdog Millionaire winning, but in all honesty, Slumdog was the only film of the five I actually liked! Furthermore, put any of them in this year’s crop, and they would have definitely been bottom tier of the 10 best picture nominees, if included at all. Louis: I hate to come off as this negative, I do like movies, but I did not really like any of these movies. The nominees just were extremely weak, and they were barely worth watching. A weak year of nominees in all regards. 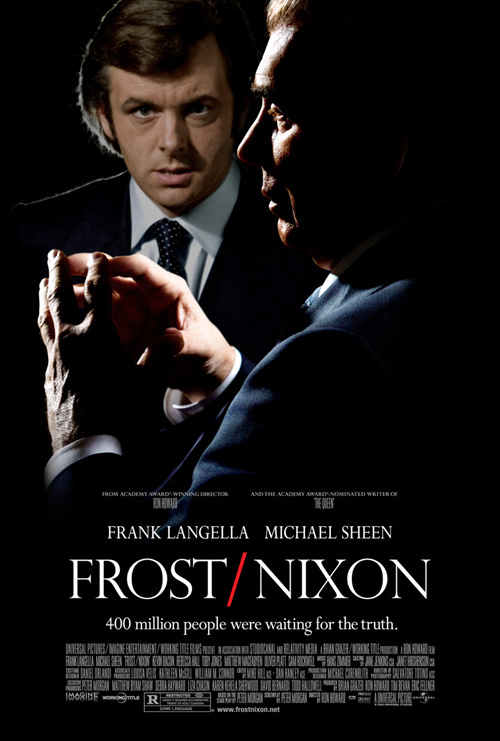 Trust me I do not like picking Frost/ Nixon as a best picture winner but I had no other choice. Malcolm: All of the nominees are great and well-executed, though some are flawed. 2008 is a great year for movies, so I’m not really sure if these five are the best that year. The 10-nominee best picture category really suits in 2008 more than any other year before 2009. Robert: This year actually isn’t as bad as most people claim. Certainly, Frost/Nixon and The Reader were a bit weaker than the others, and would have been fittingly replaced by The Dark Knight or Wall-E, or even Doubt. However, neither are bad films and though the lineup is SO typical Oscar (Holocaust, and two bio-centric movies) it also manages to break the mold a bit (a lovely fantasy and an exciting foreign pick). I absolutely LOVE Slumdog Millionaire, so I would forever give it my vote, but it was part of a stellar lineup with at least two other films that will surely stand the test of time. Walter: It’s one of those weird years. I’m only passionately attached to two. Personally, I loved Speed Racer and Synecdoche, NY, but I guess I understand how others couldn’t. Anyway, overall this was a “meh” year: nothing offensive, but not much to go mad crazy about either. So, you want to see some facts about the smackdown? I never saw that Frost/Nixon will emerge as the winner. It doesn’t have passionate lovers. But the fact is neither it has passionate haters. The other four nominees have both. Maybe that’s why it sneaked in. Early in the smackdown, I was seeing that the love/hate for TCOBB and SM will continue, and the supposedly backlash for Milk appears, and with the lessened hate bloggers have, I thought it will be The Reader. But the Weinstein curse still continue. Thank you so, so much for joining! This would have never been successful without your support and cooperation. I hope you’ll join me in an another smackdown, maybe in the near future. And to the readers, I hope that next time, you’ll be able to join in the next smackdown. Again, thanks to all. Thank God! Feel free to comment about the recently concluded smackdown. Comments, suggestions, and criticisms are extremely welcome. Adios! This entry was posted in 2008 Oscars, Oscar Smackdown and tagged 2008: Smackdown Best Picture by Juan Carlos Ojano. Bookmark the permalink. Wow, what a surprise! I would have never thought Frost/Nixon would come out on top. What a fun smackdown though, it’s great to read everyone’s reactions to each film. Can’t wait until the next one! Yes, it was never in my mind that Frost/Nixon was able to sneak in as the winner. Me too! I want to start a new smackdown. But maybe I’ll watch some more movies to relax a bit since this is quite a work. But I’m definitely willing to hurry up before school starts again. Again, endless thanks to you for participating here! A strange turn of events, I must say. I did not see that coming even though it was my choice. Well if you don’t have any ones I guess you do not need any fives. Wow. Just wow. Interesting what a difference those 1s and 2s make, since no one seemed to fall in love with Frost/Nixon. I was hoping that Benjamin Button would come out on top but ALAS! Anyhow, great fun, and I look forward to coming back for more! Wow, I’m shocked! I don’t think that 2008 was a bad year for film, but I agree, it wasn’t a very good slate of nominees. As I’ve said, my passion for Slumdog has gone down now, and I never liked Benjamin Button that much. I don’t mind Frost Nixon’s nomination, but I personally wouldn’t nominate it. 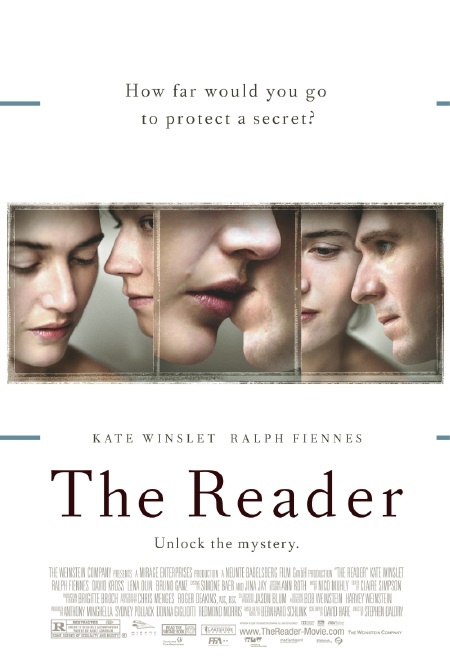 To me, The Reader and Milk were the only worthy nominees and I think I would go with The Reader as my pick. I wish Rachel Getting Married, Doubt, Frozen River, and Revolutionary Road had gotten more attention. What the F? Frost/Nixon? I guess that’s what happens when there are split votes. This is just weird. 2008 was a fair year, not horrible but not particularly excellent either. Still, it wasn’t as bad as 2005 though – YIKES. I think it’s interesting that Frost/Nixon had no 1s AND no 5s, it’s just sort of a lukewarm film, like all of Ron Howard…hahaha. But that makes sense how it won. Louis: Yes, the whole thing of F/N winning is very strange. Walter: I guess F/N benefited from having no haters at all. Joe: I agree. It’s really surprising. And about Doubt, Rev. Road and RGM, they were also deserving nominees. I haven’t seen Frozen River yet. Encore (Andrew): Yes, I guess it’s the splitting of votes. All of the other 4 have lovers and haters. And this seems just okay to the jury. It’s weird, but quite justified. Robert: I agree that it comes as just a lukewarm film. I think it’s well executed, but there’s no reason for me to be passionate or angry about it. The movie was really strong for me. It just have a really miniscule feeling that makes me want to care less for it. WALL•E is the real best picture that year! I haven’t seen the three. I hesitate to see The Dark Knight. I think it’s so….. overhyped. Hehe I’m really the only comment to your amazing writing!? It certainly is. I myself was very surprised on how this turned out.